Google CEO Sundar Pichai speaks at the New York Times DealBook conference on Nov. 1, 2018, in New York City. Google CEO Sundar Pichai emphasized the company’s patriotism in his prepared remarks ahead of Tuesday’s congressional hearing. “Even as we expand into new markets we never forget our American roots,” he wrote. Pichai is expected to be asked about political bias on Google platforms, its work with China and its decision to drop a Pentagon contract. CEO Sundar Pichai put an emphasis on Google’s patriotism in his prepared remarks for a congressional hearing on Tuesday where he’ll likely face questions about a purported bias against conservative content on search and YouTube. Tuesday’s hearing will focus on potential political bias on Google’s platforms, as well as the company’s data filtering practices, with House Majority leader Kevin McCarthy (R-Ca.) highlighting claims that Google’s business practices “may have been affected by political bias” in a statement. Google has staunchly denied these accusations when they’ve come up in the past, and did so again in Pichai’s remarks. 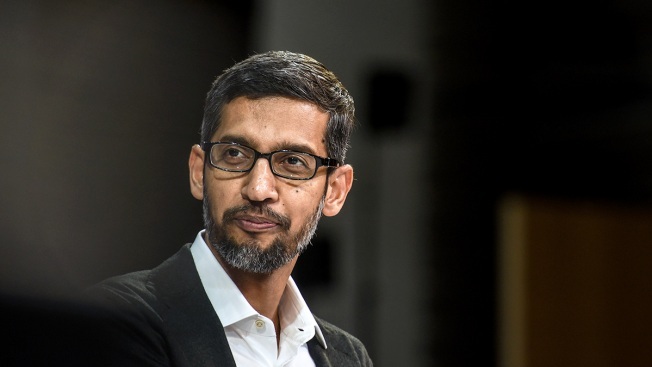 By underscoring Google’s patriotism Pichai’s comments may also attempt to address criticism around the company’s decision earlier this year not to renew a Pentagon contract for analyzing drone videos using artificial intelligence. Critics have contrasted this move with how Google has worked with China on controversial plans to launch a censored search engine there. Congress should hold hearings on why Google is willing to work with the Chinese dictatorship increasing its capacity to impose tyranny on its citizens but unwilling to work with the United States Defense Department to protect America. This is beyond unpatriotic. After The Intercept first reported details about Google’s censored search plans, human rights groups, lawmakers, and Google’s own employees all blasted the company, arguing that by cooperating with the Chinese government, it would have violated principles of free expression and users’ privacy rights, among other issues. Pichai never directly mentions either controversy, but his prepared comments dance around both. Chairman Goodlatte, Ranking Member Nadler, distinguished members of the Committee: Thank you for the opportunity to be here today. I joined Google 15 years ago and have been privileged to serve as CEO for the past three years—though my love for information and technology began long before that. It’s been 25 years since I made the US my home. Growing up in India, I have distinct memories of when my family got its first phone and our first television. Each new technology made a profound difference in our lives. Getting the phone meant that I could call ahead to the hospital to check that the blood results were in before I traveled 2 hours by bus to get them. The television, well, it only had one channel, but I couldn’t have been more thrilled by its arrival! Those experiences made me a technology optimist, and I remain one today. Not only because I believe in technology, but because I believe in people and their ability to use technology to improve their lives. I’m incredibly proud of what Google does to empower people around the world, especially here in the US. I’d like to take a moment to share a bit of background on that. 20 years ago, two students—one from Michigan and one from Maryland—came together at Stanford with a big idea: to provide users with access to the world’s information. That mission still drives everything we do, whether that’s saving you a few minutes on your morning commute or helping doctors detect disease and save lives. Today, Google is more than a search engine. We are a global company that is committed to 1 building products for everyone. That means working with many industries, from education and healthcare to manufacturing and entertainment. Even as we expand into new markets we never forget our American roots. It’s no coincidence that a company dedicated to the free flow of information was founded right here in the US. As an American company, we cherish the values and freedoms that have allowed us to grow and serve so many users. I am proud to say we do work, and we will continue to work, with the government to keep our country safe and secure. Over the years our footprint has expanded far beyond California to states such as Texas, Virginia, Oklahoma and Alabama. Today in the US, we’re growing faster outside of the Bay Area than within it. I’ve had the opportunity to travel across the country and see all the places that are powering our digital economy—from Clarksville, to Pittsburgh, to San Diego, where we recently launched a partnership with the USO to help veterans and military families. Along the way, I’ve met many people who depend on Google to learn new skills, find jobs, or build new businesses. Over the past year, we have supported more than 1.5 million American businesses. Over the past three, we have made direct contributions of $150 billion to the US economy, added more than 24,000 employees, and paid over $43 billion to US partners across Search, YouTube, and Android. These investments strengthen our communities and support thousands of American jobs. They also allow us to provide great services to our users to help them through the day. It’s an honor to play this role in people’s lives, and it’s one we know comes with great responsibility. Protecting the privacy and security of our users has long been an essential part of our mission. We have invested an enormous amount of work over the years to bring choice, transparency, and control to our users. These values are built into every product we make. We recognize the important role of governments, including this Committee, in setting rules for the development and use of technology. To that end, we support federal privacy legislation and proposed a legislative framework for privacy earlier this year. Users also look to us to provide accurate, trusted information. We work hard to ensure the integrity of our products, and we’ve put a number of checks and balances in place to ensure they continue to live up to our standards. I lead this company without political bias and work to ensure that our products continue to operate that way. To do otherwise would go against our core principles and our business interests. We are a company that provides platforms for diverse perspectives and opinions—and we have no shortage of them among our own employees. Some of our Googlers are former servicemen and women who have risked much in defense of our country. Some are civil libertarians who fiercely defend freedom of expression. Some are parents who worry about the role technology plays in our households. Some—like me—are immigrants to this country, profoundly grateful for the freedoms and opportunities it offers. Some of us are many of these things. Let me close by saying that leading Google has been the greatest professional honor of my life. It’s a challenging moment for our industry, but I’m privileged to be here today. I greatly appreciate you letting me share the story of Google and our work to build products worthy of the trust users place in us. Thank you for your attention. I look forward to answering your questions.